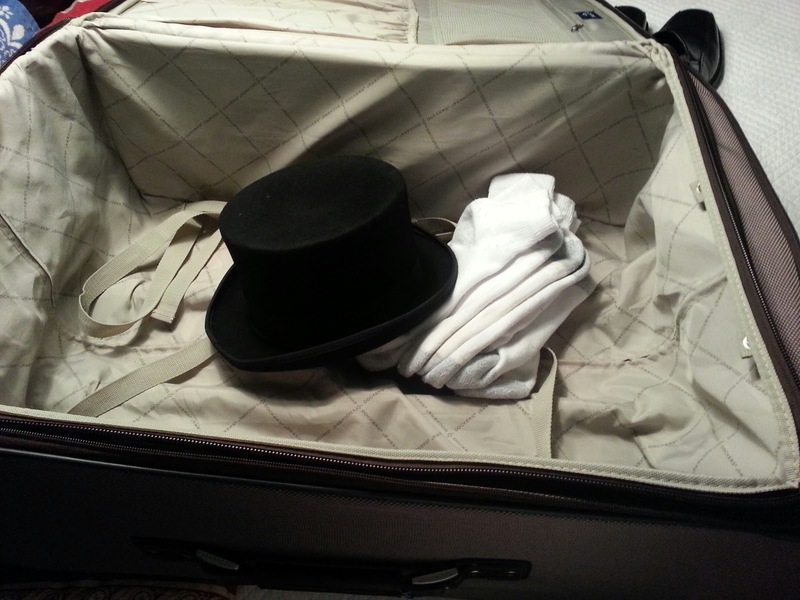 The Gentleman Crafter: Packing or Dylusioning? Well, the adventure is about to begin! Tonight, I have been trying to complete a last minute project that I need to take with me! How in the world it's going to get on the plane...I have no earthly idea! 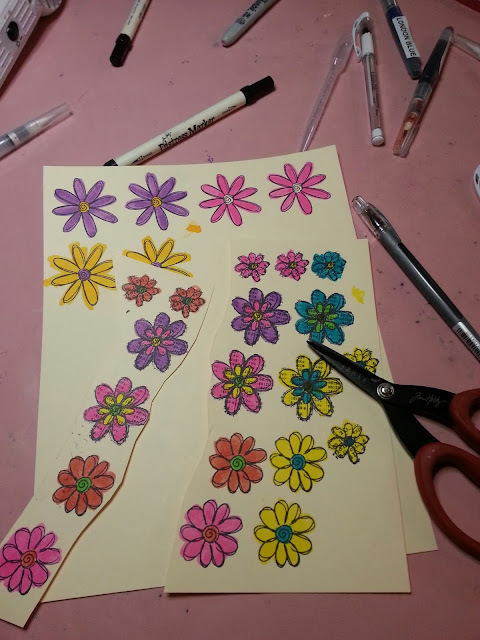 I started packing.... some socks and my John Bull Top Hat and then thought I better work on stamping and cutting out a gazillion flowers first! LOL! Oh and you know how much I love to fussy cut! Good Lawd Have Mercy! Now the project is finished I can get to packing...some t-shirts....then off to bed! LOL! Jim_R_Hankins in case you want to follow along....Thanks again PrincessLB! I kept on looking up The Gentleman Crafter! No wonder! Well, better get some ZZZZ's. Tomorrow afternoon will be here soon enough! Have followed you...gonna live vicariously through you at CHA! You've made a great start - all you need is somehing to wear between the hat an socs. Lol. I just looked at Mario's Twitter BTS. I really think you need to try and get a picture with the tophatted gentleman in the blowup of Tim's new paper. I think that would be terrific for your studio wall.Right? CHA sounds like the adventure of a lifetime! Have a fantastic time and look forward to hearing/seeing all about it! Ok dude, I have to get you caught up…you know hip to the jive kinda' thing? The social media site is Twitter but when you send a message you "Tweet" it. So you might post something on Twitter but you don't Twittering, instead you Tweet. Ok, now you are all caught up…have a great time at CHA. I cannot wait to see what sort of potions and spells you performed on chipboard and paper this time. Hey Jimbo...you really need more than your top hat, socks and tshirts...LOL!! Is there room in that suitcase for "little" ole me? I so wish I were going with you! Now I've got to figure out Twitter...can't you just FB? Truth be told...I'm not so good at FB, either...LOL!! Good luck with the rest of your packing ~ my most unfav part of tripping. I know CHA will more than make up for last minute anxieties :) Looking forward to your posts/twittering. Enjoy to the extreme, you are doing it for a lot of us. I am not so sure you can Tweet! You only have 144 characters to Tweet with and we all know you like to talk! I am jealous of your trip. You will need a few more clothes than socks and a hat. I just came from Cali... it was a bit nippy out there! Have a marvellous time Jim. I'm looking forward to your photos and wonderful tales of all the activites, projects and people. Enjoy! I can't believe that just a couple of months ago I didn't know CHA existed & now I "know" several people that will be there. I don't Tweet - it makes me crazy - so I'll be following you on FB and here. Have a great time and make sure you pack some trous! Have fun Jimbug! You are gonna impress everyone-they will love your creations. I'm following on Twitter. Don't forget to update us. Will be lurking around blog, FB, and Twitter. Don't forget your business cards. You will need those. You rock. I am looking forward to hearing about all the new products. Have fun, I will be thinking of you all on Sunday. Hey Jimbo, Be sure you take some warm clothes with you or you are going to freeze you know what off. It's really cool right now and with the Artic cold front moving through as I type, California is being hit too. Have a fantastic and safe trip Jim. I know you will knock em' dead with you work. It took me a while to figure out my twitter info too but it's all ready to go. I'm so excited and I know you'll keep us posted. Have a great time!!!! You crack me up!!! I can feel your excitement through your posting! You are awesome and can't wait to see all the cool stuff that is being released!!! Have a wonderful and safe trip!!! Are you too excited or, what? Welcome to my side of town.....Try to get in a trip to Disneyland. I heard this was a vendors only event. Was looking forward to catching a glimpse....No, I am not a stalker--just a new fan! Have fun and tell Mickey I'll see him next month....Putting monthly pass to good use. Have a great time! And show us lots of cool goodies!! !